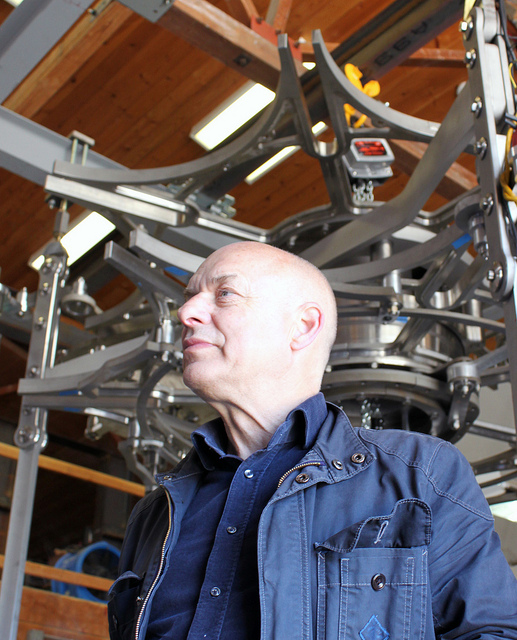 It features sound by Brian Eno that uses recordings of the 10,000 Year Clock (in progress) and visuals taken directly from the clock design as well. This intro video was conceived by Alexander Rose, James Anderson and Chris Baldwin. The sound is by Brian Eno with additional recordings and arrangement by Chris Baldwin which includes sounds from the workings of the 10,000 Year Clock. The animation was created by James Anderson using actual model geometry of parts used in the Clock. The animation is © The Long Now Foundation 02013 and the sound is © Opal Ltd., London 02013. We hope it is enjoyed by everyone who already knows about the Clock and will be a compelling clue for others to want to learn more. Thanks to James, Chris, Brian and everyone else who contributed to making this well-crafted representation of The Long Now Foundation. Last week we announced that Brian Eno is designing the ambient sound for the Long Now Salon as well as a dedicated light-painting installation for the space. Brian is a founding member of Long Now’s Board of Directors.